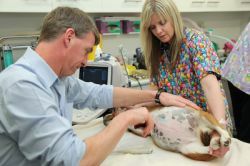 At the Middle Brighton Veterinary Centre we pride ourselves in offering you and your pet the best in care and service. Your team is dedicated to the health and welfare of your pet and we aim to provide the best possible treatment that modern veterinary science can offer. We care about your pets and we care about you. We go into detail on what we offer and put your mind at ease when you leave your pets in our care. We are pet owners ourselves, so we understand the loyalty, love and enjoyment that pets bring into our lives. You can be sure that your special pet will always receive the best care and attention when you visit our practice. It is our policy to offer you treatment options for your pet, so you are able to have input into the most appropriate course of action for your pet.